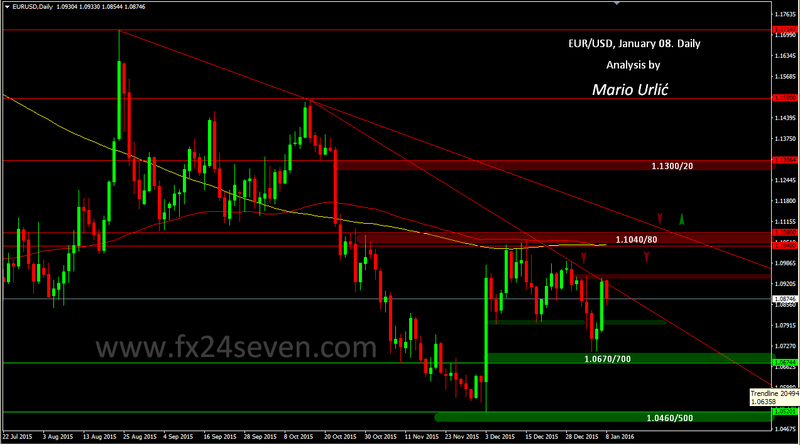 EUR/USD, sellers are in place! As I wrote in my previous EUR/USD analysis from January 04., that despite the bullish beggining of the year, the pair could fall down after it touched the down trend line, it did at the same day. But, the pair has find a buyers at 1.0710, near my predicted support and they have pushed the euro strongly up yesterday, again to the same trendline and resistance at 1.0940/50, which holds again. The sellers are in place and daily MA100 and 200 are not easy to reach here, as I wrote before. On the way back down, 1.0800 could be the first serious support, minnor at 1.0830/40, stronger one is placed at 1.0670/700. Could we expect a long term tight range trading here before some serious central bank moves?